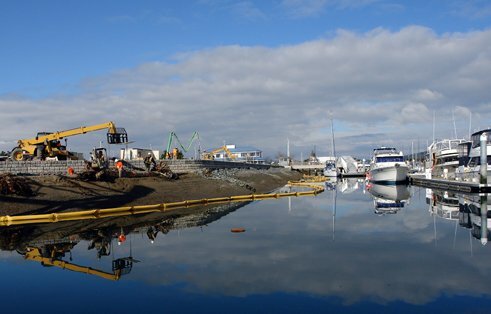 Cleanup at the Cap Sante Marine site—the first major project completed under the Port of Anacortes' Focus Fidalgo initiative. 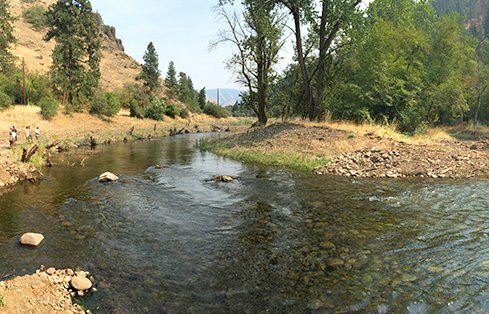 At Kentch Reach, GeoEngineers' River Team created new channel alignments, enabling the river to meander back and forth across its historical floodplain and adding nearly a mile of new habitat. A direct-push drilling machine at the Palermo Superfund Site collecting subsurface environmental data. 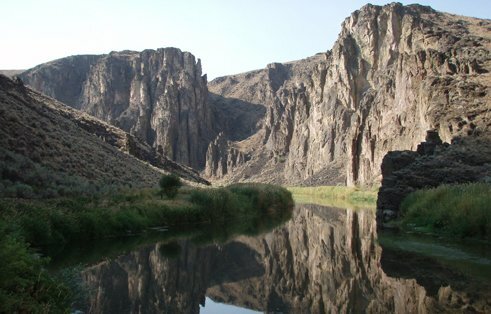 The 45 Ranch project created more than 25 acres of new or enhanced wetlands and wet meadows. GeoEngineers specializes in environmental investigation, remediation design and construction management. Put simply, when natural systems are damaged, we repair them. From investigation and cleanup of historical impacts at federal Superfund sites to monitoring and predicting airborne risks from a point source or vapor intrusion, our experts have it covered. We are known for our depth of resources and ability to think strategically and implement effectively. Often, these sites are complex, affecting many diverse stakeholders. By working closely with clients, land owners, local stakeholders, environmental agencies and the general public, we look for unique solutions that satisfy our clients and produce scientifically sustainable results. 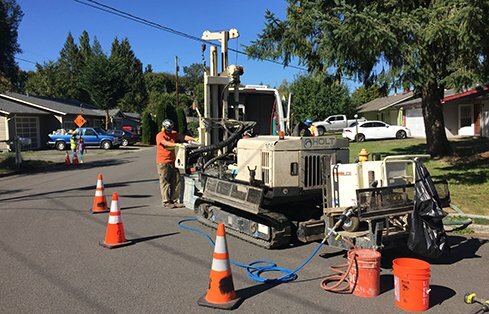 We remediate and help redevelop historically contaminated sites for future use, complying with the United States Environmental Protection Agency regulations and state guidelines. We help land owners and developers understand and mitigate their risks by thoroughly investigating the overall ecological health of a property, both developed and undeveloped. Our environmental experts use a variety of scientific tools to investigate and characterize the extent of a site’s soil and groundwater contamination. A detailed understanding of subsurface features is the first step toward a feasibility study and ultimately the successful cleanup of a site. We work closely with our clients to find the ideal cleanup plan that balances liability and cost to deliver a sustainable remediation that protects human health and the environment. Our combined experience with rapid environmental response and state and federal regulatory frameworks means we’re ideally positioned to help in the wake of environmental accidents such as fuel spills and other hazardous material releases. We guide our clients through each step of the Natural Resource Damage Assessment legal process and point the way toward successful remediation. Whether we’re working with the responsible party, impacted land owners, or government agencies, GeoEngineers can design a strategy to bring a contaminated site back to beneficial use. Mitigating client risk is at the core of our consulting practice. We assess environmental risks that can cost our clients money, time and resources. By identifying these risks and offering mitigation strategies, we equip our clients with the tools to make informed business decisions. When volatile chemicals, such as fuels and cleaning solvents, become vaporized they can pose a threat to human health. These vapors can rise from contaminated soil and groundwater, finding their way into our homes and workplaces. We help property owners identify this potential risk and mitigate it to protect themselves and public health. We work closely with our clients to prepare them for community and media events. As environmental experts, we help organize public meetings, prepare message points and project update materials, and help company spokespersons anticipate and prepare for tough questions. Our remediation professionals know how to explain complex technical concepts in simple, understandable terms, and our 3D GIS modeling capabilities allow us to prepare 3D renderings of subsurface conditions that are otherwise difficult to convey to the public. GeoEngineers provides far more than geotechnical and environmental recommendations and guidance. We’re there every step of the way during project construction, working closely with contractors to ensure that the earthwork elements are constructed according to design recommendations and that hazardous materials are removed and categorized appropriately for disposal. Our experts work to reduce our clients’ liability and protect water resources from contamination with strategies to control and reduce groundwater contamination at its source.